What Does Sewer Line Insurance Cover? Did you know that replacing a sewer line can cost thousands of dollars? As septic systems age, they can crack and leak. When this happens, lines can become clogged and wastewater could back up into your home causing even more expensive water damage as well as potentially exposing your family to dangerous health risks. Damage to sewer lines can cause homeowners inconvenience and expensive repairs. A few problems you may experience are: damage to a sewer line include blockage and back-up of indoor toilets and other plumbing fixtures, a foul sewer gas odor in your home, blocked drains, mold, outdoor water leaks on your lawn, pools of septic water in your yard, sinkholes, rodent/insect infestations, and cracks in your foundation. No one wants to deal with all the inconvenience and expense without having a plan in place. You have a few options when it comes to purchasing a sewer line protection plan. Since many homeowners insurance policies exclude coverage for sewer lines, you may be able to add coverage by an endorsement (rider) to cover sewer backup. You can check with your current homeowners insurance company to see if this endorsement is available and what the specific cost is for adding sewer line coverage. Another option is to purchase a policy from a company that specializes in sewer line protection. Many homeowners insurance policies don't include sewer coverage automatically, but they can be added with an endorsement or rider. Septic tanks can crack and leak as they age, causing water to back up into your home, causing mold damage and bad smells. Damaged sewer lines can be expensive and inconvenient to repair. Make sure the insurance is actually insurance and not just a home service agreement, as these companies aren't regulated like insurers. Be wary of conditions that could void a contract, such as acts of nature like floods. Check for complaints with the Better Business Bureau. If you purchase sewer line coverage, the insurance company will schedule a repair for you whenever you experience damage to your sewer line or damage caused from sewer backup. Most sewer line insurance companies use local and licensed sewer line professionals to perform repairs. The repairs are guaranteed and normally you will sign a form saying you are satisfied with the repair work that has been completed on your sewer line. Where Can You Buy Sewer Line Insurance? There are a couple of companies that specialize in sewer line insurance, American Water Resources and HomeServe USA. Some companies are not actually insurance companies, and they are only selling you a maintenance agreement. If the company isn't an insurer, it won't be regulated in the same manner. Additionally, check the Better Business Bureau for any complaints before making your final provider choice. American Water Resources has been in business for over a decade and has over 1.8 million service contracts. 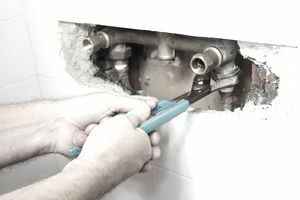 The company services homeowners, utility and municipalities across the U.S. and provides services on water lines, sewer lines, in-home plumbing and interior electrical lines. The company’s sewer line coverage provides up to $8,000 in repairs for a residential sewer line including $4,000 for sewer repair service line repair and another $4,000 for any sidewalk or road repairs that need to be completed. American Water Resources (AWR) has a customer support line for assistance, 1-866-430-0819. All work completed must meet the standards of state and local codes. Coverage begins at about 30 cents per day and no home inspection is required. Pricing and payment options may vary by state. HomeServe USA is an independent contractor providing home repair services and has been in business for over a decade. It is accredited by the Better Business Bureau and provides services to over 3 million homeowners across the United States and Canada. In addition to homeowner’s services, it also services more than 450 utility companies and has more than 4.5 million service plans. It provides plans for plumbing, electrical, heating & cooling, and combo plans which cover more than one service. Sewer line coverage from HomeServe USA has a $0 deductible along with a 24-hour repair service hotline. Only local, licensed, and insured contractors are hired to perform sewer line repairs. There is a one-year guarantee for all sewer line repairs performed by HomeServe USA’s licensed repair contractors. Every homeowner has a potential risk of having to replace sewer lines and the cost to replace these lines and cover any damage caused by water backup can be very expensive. You will have to weigh the pros and cons and decide if sewer line protection is right for you. If coming up with thousands of dollars to replace/repair damage from sewer line backup will be a financial burden, you may want to consider either adding an endorsement to your homeowners insurance policy or purchasing a specialized policy covering sewer lines.